Guard patrol system and patrol app technology should be simple to use, affordable, and equally easy to deploy. With GuardMetrics, you will be able to launch your security guard patrol system with less than an hour of training, though our Support experts will be here to help you on an ongoing basis. And the GuardMetrics Support team is here when you need us, and where you need us. Unlike 90%+ of the security guard patrol system providers out there, our Support team is based right here in America, with decades of experience in the security guard business, so we know that security is a 24/7 job. And you’ll be pleased to know that your data is stored here in the USA too (and perhaps, equally shocked to learn that several of the biggest guard patrol system providers store your client data in Europe, Greece, Canada, India and elsewhere). Call us now, or click here, for a demo of this American security guard patrol system and app. The fact that the GuardMetrics patrol system is so affordable and easy to deploy, by no means implies that it won’t accomplish exactly what you are looking for. All your submitted patrol and guard tour events—your daily activity reports, Incident Reports, checkpoint tag scanning, etc.—are time stamped and geo-tagged, for full transparency. And there is no tricking this guard patrol system. If an officer clocks in, or starts their shift at the post by swiping a checkpoint, that event will also be time-stamped and geo-tagged with a GPS tracking map-point-view. So the old horror stories of the rare guard getting away with duping the checkpoints and scanning them all from home is now myth, once you launch the GuardMetrics security guard patrol system anyway. Call to see how we can give you peace of mind with this security guard patrol system and app. 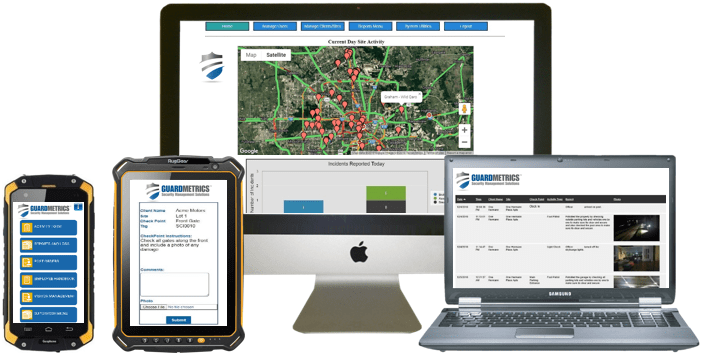 Your officers can also attach pics or videos to their field reports, daily activity reports, and checkpoint scans with the GuardMetrics security guard patrol system and tracking app. With a few clicks and a speech-to-text dictation of any relevant data, your mobile guard will be able to submit a polished report to your branded platform in real-time. These reports will all be branded with your logo and can then be sent directly to your clients through their respective “Client Portals“, where all their data is stored, sortable and printable, to view their own site reports, pics and videos, whenever and however they wish. This stakeholder-portal feature is convenient for both your client and for you, in that many clients will no longer require reports to be sent via email when they can access them–still branded to your security guard company–whenever they wish. That said, this guard patrol system does still allow you to email reports, if your client insists on the old way. The days of turning keys or touching “buttons” are over. Today’s stakeholder knows that real-time security guard app technology exists and they want to be assured that their security guard patrol company is tracking their mobile officers and doing what they are supposed to be doing. And they want to know when they want to know, not a day or a week later. 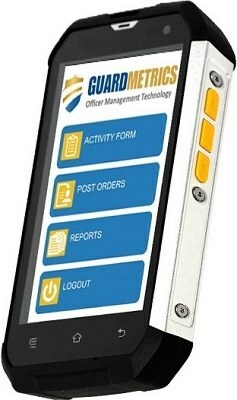 The GuardMetrics security guard patrol system does all of this, and a lot more. 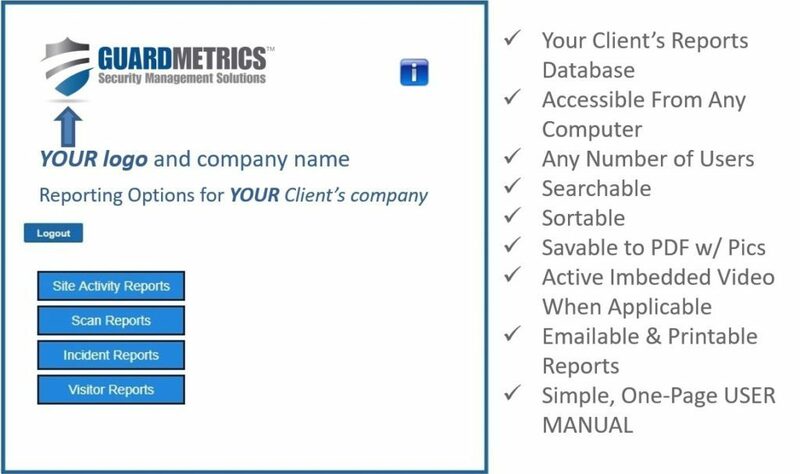 Give your clients service that your competitors cannot provide with complete accountability and transparency through the GuardMetrics security guard patrol system. Call us for a demonstration of this security guard patrol app software at (800) 825-6858.